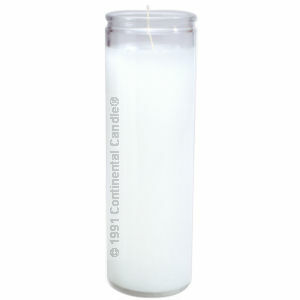 Our tall glass, solid white wax candles are popular all year. Use for any occasion, such as for decorative use, holiday, arts and crafts, temporary lighting or for "setting the mood". Made in the U.S.A. by Continental Candle Company. Continental tall glass candles are manufactured using quality wax for a long, clean burn, 100% cotton wicks, and a special process to ensure high quality. Always follow safety instructions when burning any candle.